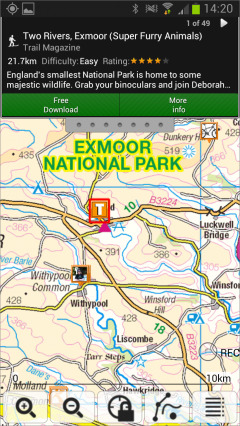 Don't miss out on the new release of ViewRanger for your Android smartphone or tablet device. By very popular request, we’ve implemented map rotation on 3.3.7, this means that with this mode active, the map rotates to keep the direction you are heading straight up the screen. To enable this go to Organizer > Settings > GPS > Auto rotate map. With over 30,000 expert & community routes around the world now available to download on ViewRanger, we wanted to create an easier way to browse and view search results from the map screen. The route search process is unchanged ie Menu > Search > Search for routes, but now by tapping on any of the route icons on the screen, you’ll see a sliding panel at the top of the screen showing summary information about the route. If you like this route, you can get more info and even download it, directly from this screen. Want to view others nearby?.. then simply pull down the sliding panel to see a list, or side swipe to view the next. We’ve introduced a new action bar using another sliding panel (see screen grab). By tapping on the item (NB once active the item will be highlighted with a red square), the action bar then offers a range of options ie follow a route or view its details, navigate to a POI or view track details. Once again by pulling the sliding panel, you can view other similar items, and side swipe to switch item type. ViewRanger helps to provide its service to Search & Rescue (SAR) teams as part of our commitment to outdoors sports activity. We are very proud that our app is used by a growing number of SAR teams in the UK, Ireland and recently USA, Canada and Germany. The new version includes a feature specifically requested by SAR users to allow them to use our service more easily at night. In night vision mode the screen is redrawn in red to protect the eyesight's dark adaptation. Finally, we’ve tuned up the app to give faster map drawing on many devices. We’ve also made some changes to improve the downloading of online maps whilst panning the map to reduce the likelihood of the process stalling.